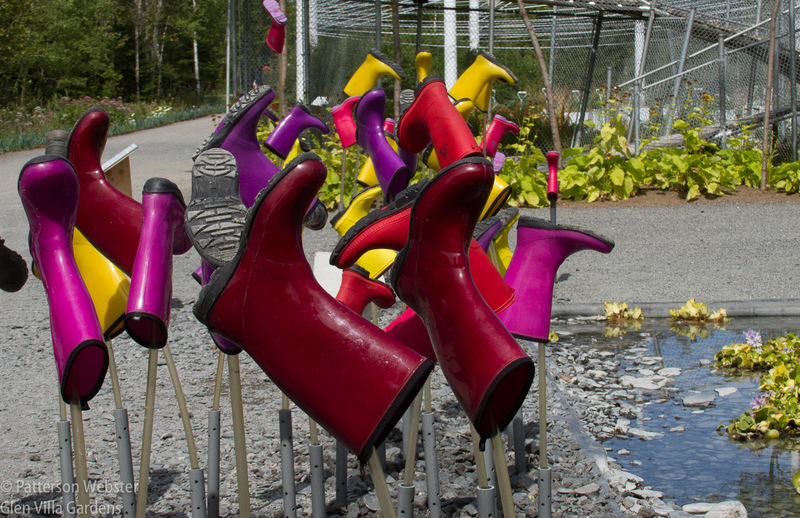 Recently I visited the International Garden Festival at Metis, Quebec. I’ve attended the Festival many times since it first opened in 2000, but in previous years I’ve gone with adults. This year was special — I went with two teenage granddaughters. 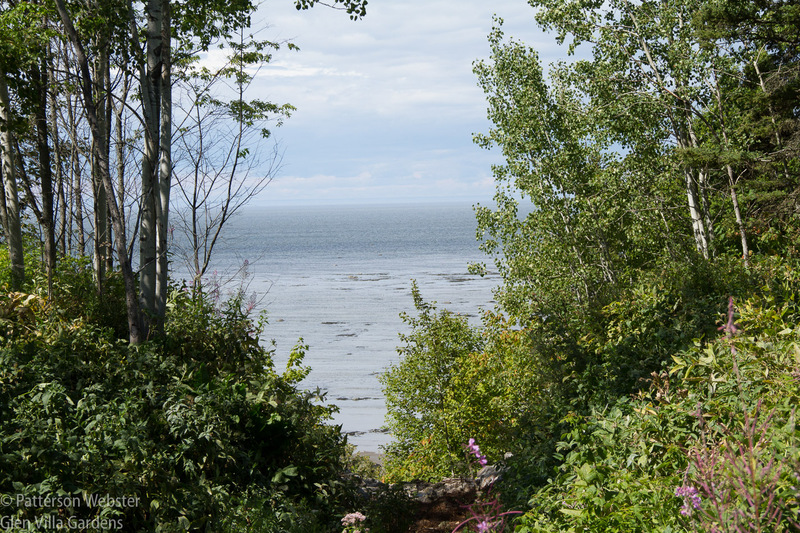 The festival gardens are adjacent to the St. Lawrence River in a part of Quebec that offers much to explore. Playsages, the theme for this year’s Festival, was a good fit for the three of us. The word is a mash-up of languages, blending ‘play’ with the French word for landscape (paysage). While I’d happily attend the festival any year, this theme told me to make the trip this year, and to take along some younger eyes. It was a great decision. 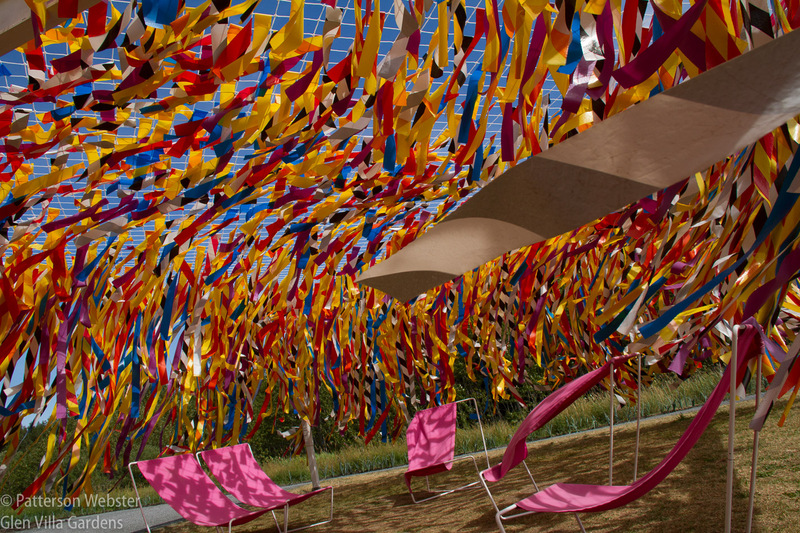 Six of the 25 gardens on view are new this year, and of these our joint favourite was The Woodstock. This interactive installation is simple in concept and engaging in practice. Both girls climbed up and down the tree stumps, playing a teenage version of King Queen of the Castle. 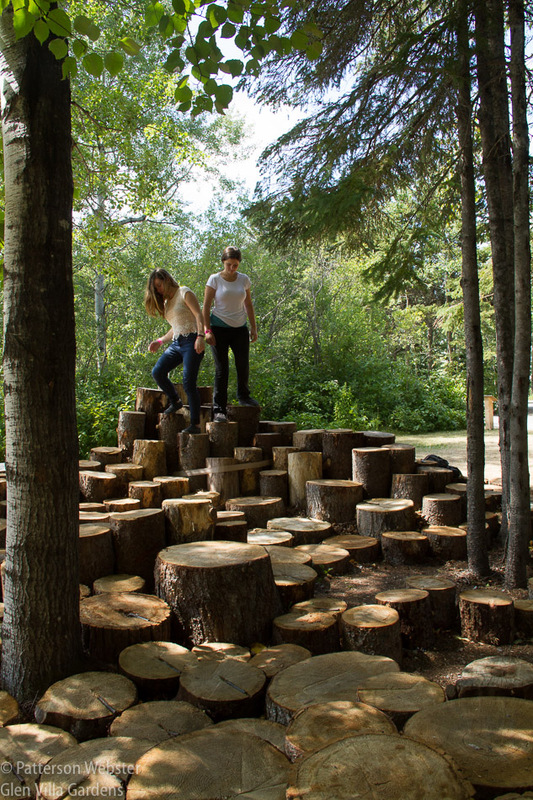 I admired the way the stacked stumps of varying heights defined the space, creating a playground that simultaneously provoked exploration and contemplation. Designed by Atelier Yok Yok, this installation was inspired by the stacks of wood gathered by loggers. 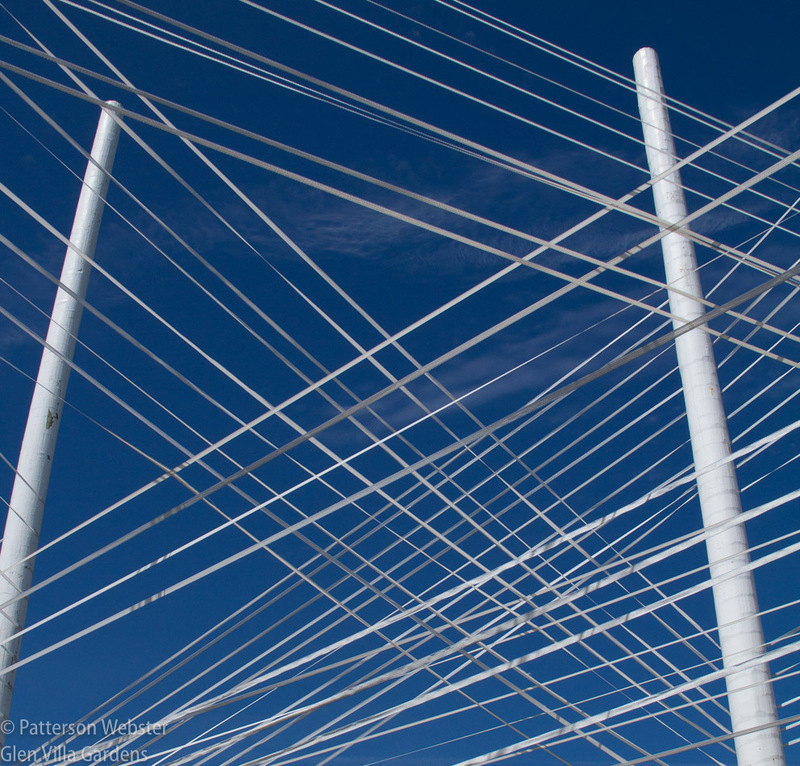 Pushing the idea, the installation can be seen as an echo of the life cycle of a forest as it is affected by human beings. Not surprisingly, the girls liked the interactive projects the best. They liked splashing around in a shallow pool, wearing the rubber boots provided (Se Mouiller (La Belle échappé) by Groupe A/Annexe U.) They liked walking through the woods to the quiet spot where a swing hanging from a tree gave a nod to solitary enjoyment (Haiku, by Francisco A. Garcia Pérez & Alessandra Vignotto.) They liked making patterns in the gravel (Around-About, by Roy Talmon & Noa Biran) and loved lying flat on their backs, looking up at the trees and listening to the sound of bells ringing in the wind. I was equally enchanted by Soundcloud, where the mixed music of the wind and the bells established a dialogue between natural and artificial sounds. The bell-shaped flowers planted around a white cloud-like pouf added a visual element that mirrored this mix. 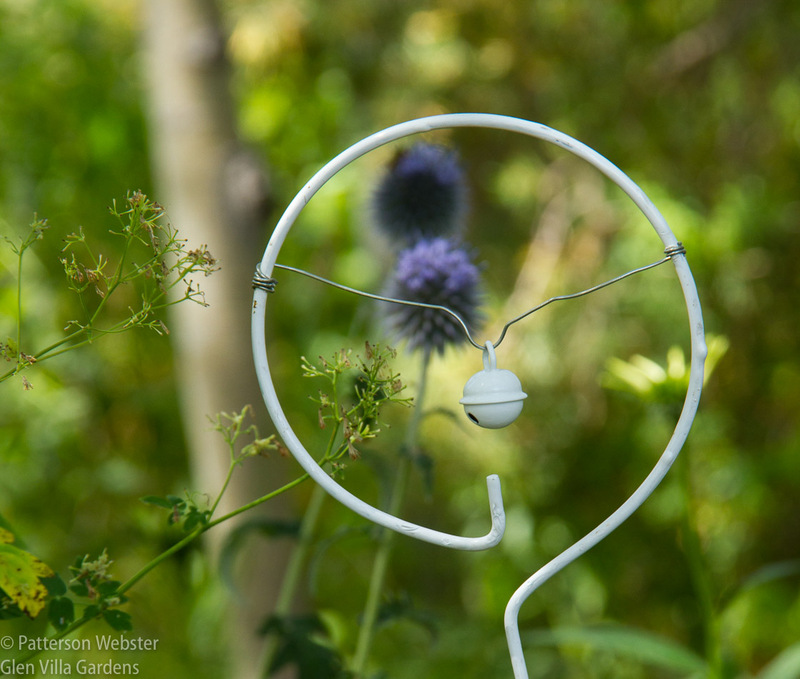 Soundcloud, by Johanna Balhaus and Helen Wyss, used ‘bell flowers’ planted in the ground and hung on branches. Each bell produced a different sound. I was less enthralled by I Like to Move It. The girls had fun with this garden, pushing a full-sized tree back and forth along a trench. (The best part, they said, was leaving the tree smack in the middle of a path, forcing people either to walk around it or to move it back into its ‘proper’ place.) For me, though, this installation was a disappointment, despite the fact that the idea of moving trees around and forming different relationships is appealing. Reasons for my reaction are easy to identify. This installation is in its third year and the wear and tear is showing. One of the original three trees is dead and what used to be a seemingly wild meadow is now a platform covered with wood chips, with the mechanics too obviously visible. Pushing a full-sized tree along a track was fun but you really need three trees to set up design relationships. We all liked Making Circles in the Water, by Balmori Associates, now in its 7th year. 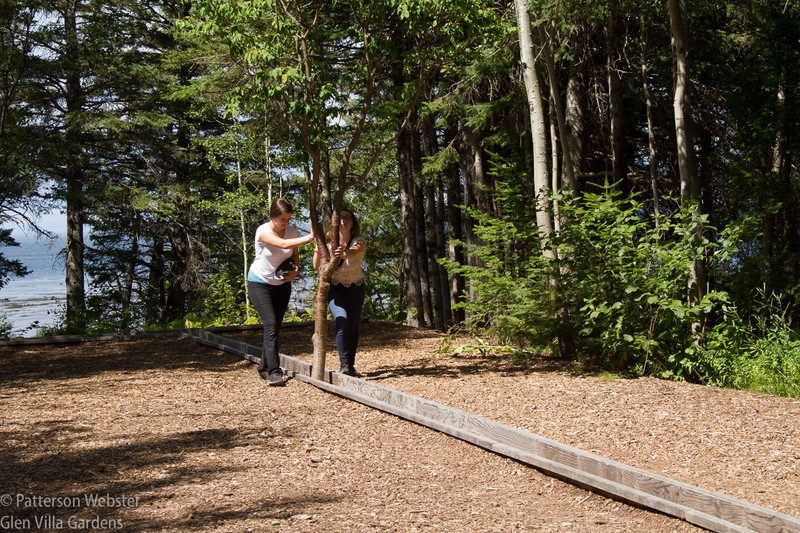 This series of circles leading towards the St. Lawrence River is a successful experiment in seeing, focusing the view and visually connecting the forest to the water. 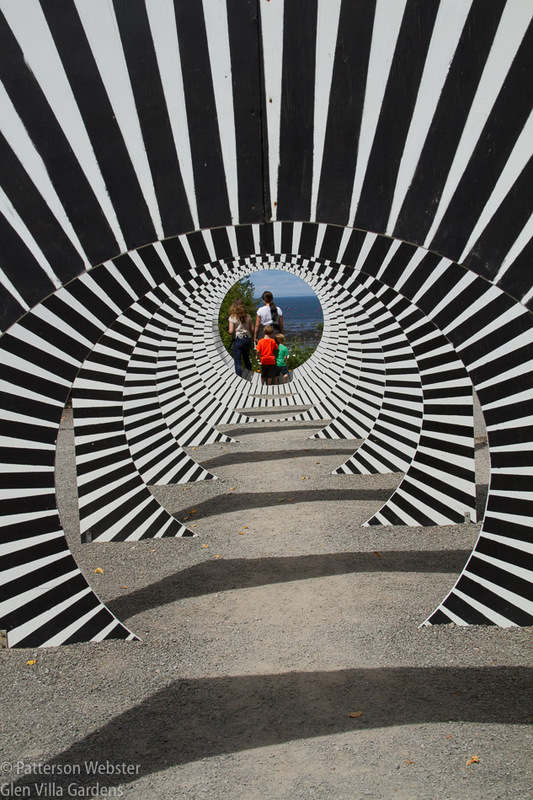 The installation engages the body as well as the eyes and mind; almost no one can resist walking through the circles, skipping and laughing as they do. Now an eye-popping black and white, the panels were originally painted in shades of grey, less dynamic but more subtle. I’m not sure which I prefer. Courtesy of Nature was another garden we all liked, not for its playful qualities but for the direct simplicity of its concept and the sense of reverence it established. 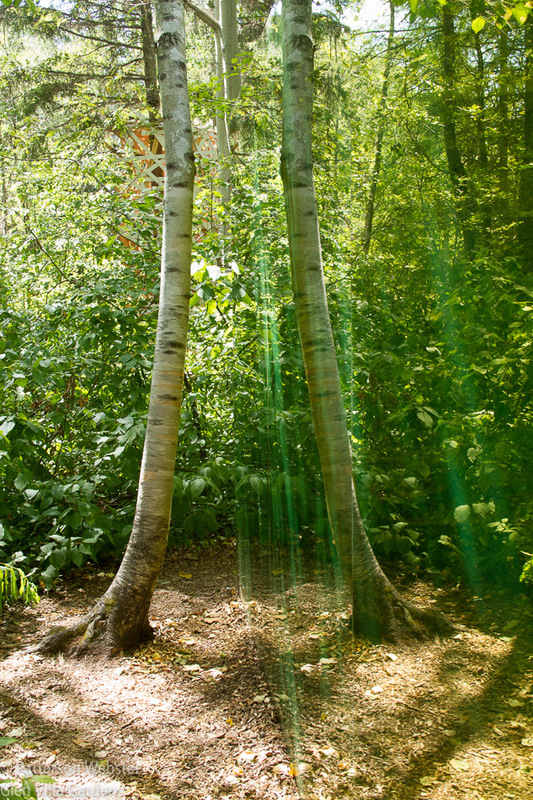 This garden by Johan Selbing and Anouk Vogel encloses three tall trees in a black box open to the sky. The effect is to focus attention on what could easily be overlooked, to set apart a tiny piece of nature and thereby to transform it into a jewel-like work of art. 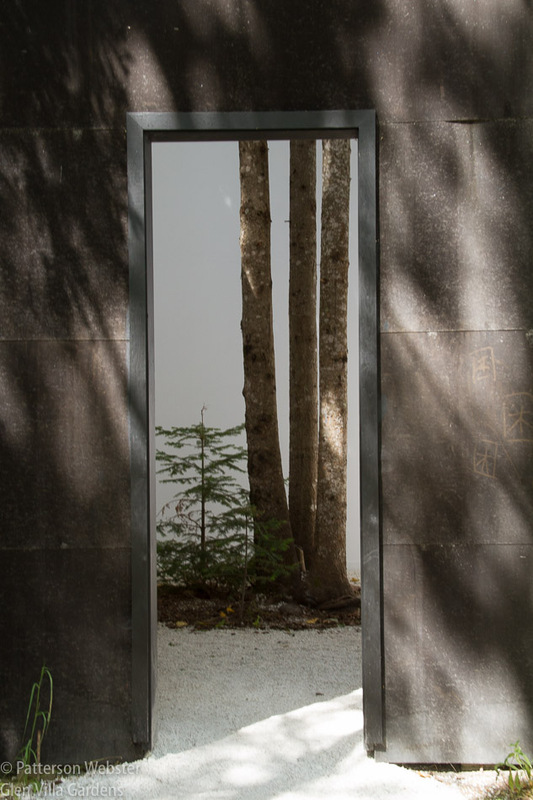 The black exterior walls blend into the forest; the white interior walls present the trees like works of art in a museum. Not surprisingly, the small evergreen has grown a foot or so since I saw this installation in 2013. A perennial favourite is Hal Ingeborg’s Reflexions colorées, where semi-reflective tinted plexiglass confuses inside and outside views that change seasonally and with the time of day. Which birch tree is where? For sheer delight, though, our joint favourite of all the gardens was Vertical Line Garden, by Julia Jamrozik and Cory Kempster. I’m told that in previous years the streamers were black and white. While that choice may have been striking, the multi-coloured streamers were pure joy. Sitting on one of the pink chairs beneath was like being in the midst of a gentle hurricane, exciting but non-threatening. It helped that the wind was blowing regularly on the day we were there, but even with the lightest breeze, the streamers would have blown and flown. Was an answer blowing in the wind? Boots of all colours and sizes encouraged people to wade in the pool of Se mouiller. or that elastic ribbons could create cat’s cradles in the sky? Le bon arbre au bon endroit is another long-time installation, by NIP Paysage. 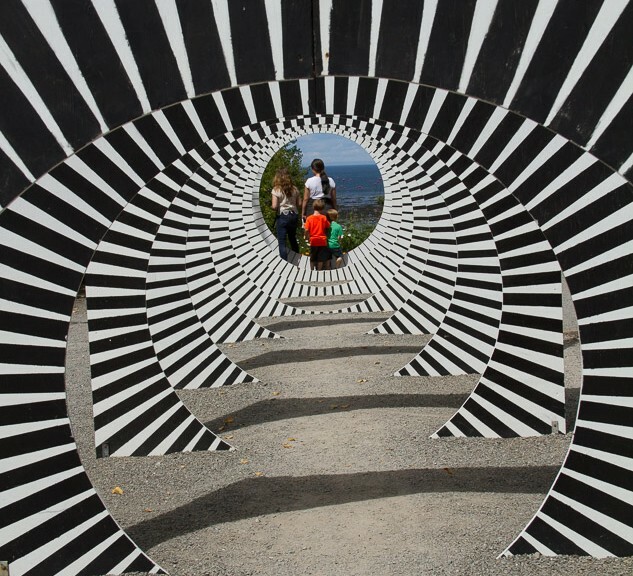 Getting to the International Garden Festival at les jardins de Métis takes time — it is a 6 hour drive from Montreal or a 90-minute flight to the nearby town of Mont Joli. But it is well worth the effort. And in addition to the Festival, there is an historic garden that provides a richly traditional garden experience. I highly recommend both. 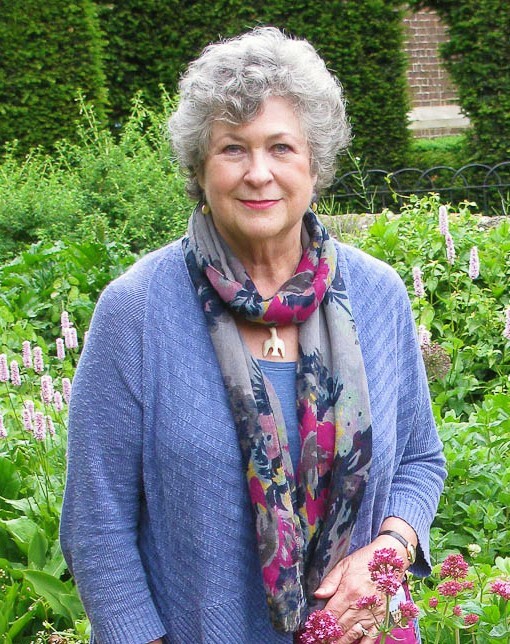 Thanks for sharing these insights – garden festivals are such a wonderful opportunity to explore aspects of gardens that might not be something someone would want to live with in their daily garden. You can do something weirder, more intense, more outrageous. Thanks, too, for reminding me of that we have this wonderful Garden Festival in North America – I tend to think mostly of Chaumont, Hampton Court, and Singapore. Chaumont and Metis both have gardens that last for a whole season. I think the gardens at Hampton Court are there for a much shorter period — and the length of time that the garden needs to be in good shape is a big factor in the design. I’m not familiar with Singapore’s festival so will have to do some research… thanks for that pointer. I’m not familiar with how Cornerstone operates either — I need to consult Pam Penick’s recent post on her blog Digging. I read your piece on ThinkinGardens with great interest, Caleb. I am a big fan of conceptual gardens, however defined. I like gardens that make you think as well as admire. And I agree, if I get to CA I’ll head to Cornerstone. Ditto for Singapore! I would like to see the whole area one of these days!